CYFOR were contacted directly by a manufacturer through the recommendation of a solicitor. 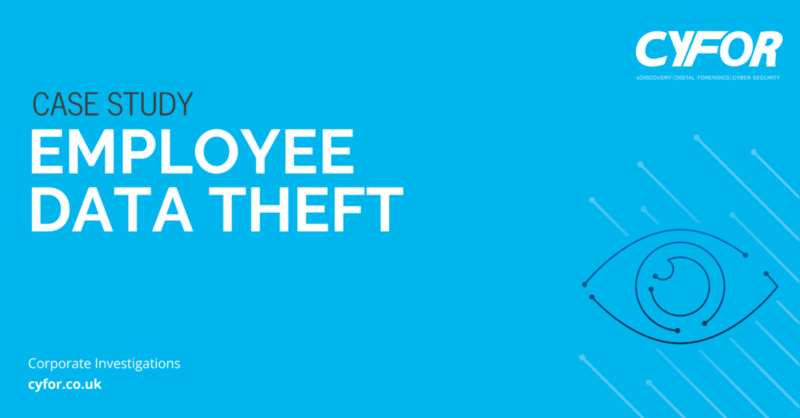 The business owners suspected that a former employee had upon leaving, stolen company data to start up a competing business. The individual’s former employers filed litigation proceedings and took him to court. During the former employee’s defence, he divulged information that he could not lawfully been aware of during his employment tenure. It transpired that he was in a coalition with another former employee who had left the company several years earlier. The information that was exposed gave the Directors of the business a demonstrable reason to suspect more fraudulent activity from the former employee. Internet Evidence Finder (IEF), version 6.9.1.6423. Once CYFOR were instructed by the client, the subsequent investigation led us to forensically image, preserve and analyse electronic data from laptops, mobile phones and servers, with the core focus being on emails. This also included the requirement to recover deleted data from the old devices of the former employees. As they approached CYFOR directly, our eDiscovery experts dealt solely with the directors of the business and gave them access to our online review platform, Relativity. The eDiscovery team provided extensive project management support and identified all the relevant keywords and date ranges applicable to the investigation. As we worked directly with the client during this investigation, we were able to go straight to the electronic discovery (eDiscovery) phase, utilising the Relativity online review platform to disseminate the data. Typically, during such matters, a company would instruct us via a solicitor and go straight to court proceedings via electronic disclosure (eDisclosure). This would be far more expensive and time consuming, thus highlighting this alternative approach as a more cost and time efficient exercise.